Hi Ozone, thanks for the question. The researcher conducting that study intends to publish the full details in a peer-reviewed journal once the study is completed. Maximus may we presume the triggering of autophagy by fasting does not mimic chemical intervention? Joseph bailry III Hi Joseph. From my understanding, that is not a simple question to address, though I recently came across a recent research report that suggests that fasting does not have the same effects as chemical intervention like rapamycin. Basically, fasting reduces mTOR, but senescent cells seem to keep mTOR elevated all the time, even under fasting-like conditions. Chemicals like rapamycin seem to "force" mTOR to turn down, even in senescent cells that usually have it elevated all the time. Turning mTOR down generally enhances autophagy. Thus, compounds like rapamycin could be expected to have effects that fasting will not. Does anyone know what Compounding Pharmacy carrries Dasatinib? Brennan I continue to inquire but so far only sources from India and China. I am frozen in action. How about you.? Kerry Do these sources require a prescription? If not will you post the links? Kerry in another discussion, someone posted that they had labs test the quality of the Indian drugs vs the US made ones and the quality seemed to be equal. That encourages me to buy the dasatinib from the Indian sites. Brennan I am obtaining my Dasatinib from an Indian company which also supplied me with Rapamycin and Metformin. I have been very happy with their products and their prices were very reasonable compared with others. Brennan Contact dropshipmd.com They're in India. For $330 I ordered 60-70mg tabs of Dasatinib. Caveat Emptor! @jerry searcy Yes Jerry dropshipmd.com is the Company I deal with and they are an Indian company. I can't comment on the purity of their product, but you will be impressed with the packaging, if that is anything to go by! Their email address is:- trademedimpex@gmail.com and I deal with a very obliging man called Soni Jain. Attached is a chart showing the dosages that were used. In process of a trial of Dasatinib and Quercertin. Begin yesterday morning, at 9:30am I calculated the dosage at 200mg Dasatinib and 2000mg Quercertin. I was able to obtain 20 mg tabs of Dasatinib, so I took 10 tabs. I obtained 500mg tabs of Quercertin, I took four of these. I noticed at approximately 3-4 hours very mild nausea, but no vomiting. I took the trial on an empty stomach and at 4 hours had a cup of soup, no problem and it resolved the nausea. All was well all day until around 8pm when I ran a mile fever of 99-100 degrees. Took a 500mg Asprin and I went to bed at 9:30 with chills , low grade headache and general malaise. I had chills for several hours, and slept on and off over the course of the evening. Woke up at 8am today, no fever or chills, just a little tired. All of this seems to be inline with reported symptoms by other experimenters. Will advise if any physiological change. David Michel Just an update at 5 days post ingestion of D+Q. The aftermath is that I have been tired, and a little brain fog. This hit me harder that I though it would, but as I am 76 years old I suppose I have more Senescence cells than a younger person and correspondingly more die off. I am still going to do the second dose this Monday, but not looking forward to it. I will advise of the outcome. David Michel Begin my second round of D+Q this morning, one hour ago. Took on an empty stomach so the dosage does not compete with other nutrients or drugs. David Michel Day two of the second round of D+Q. The second round has been much easier than the first round. I had no symptoms other that a mild headache which resolved with a 500mg aspirin. I had to chills or fever. Second day feeling normal. I think the first round must have removed a number of Senescence cells that were sensitive to D+Q so by the second round there probably were not a lot to remove. This makes me think if studies say the D+Q combination only remove 1/3 of Senescence cells the remaining cells must require another protocol. David Michel I had no fever or chills. David, at 76 do you have now or in the past had any joints with arthritis? You are one of the best self testers on this site. I am 70 and use metformin, fisetin, aspirin, quercetin, coq10, and a few other hard to remember named supliments. I am considering rapamycin and dasatinib when I can get script. Second question, have you heard of any rapamycin users who have reported cataracts, or testecular atrophy from intermitant rapamycin use? are we there yet If I have any arthritis it is very slight, occasionally I seem to have positional postural stiffness, and have had some idiopathic peripheral neuropathy which seems to have not been hurt or helped by my testing. You don't need script to order out of the country. As to any side effects of Rapamycin, I am taking Sirolimus which is another name for Rapamycin. I have been taking it for two years. I have made the following observations: About 6 months into taking 6mg weekly, I developed idiopathic nausea and vomiting. Doc's could find no reason for this, however I stopped taking rapamycin for 3 months and resumed at 5mg every two weeks ,as I take a lot of things that reduce MTOTC1. There have been some report of stomach problems associated with Rapamycin thinning mucous membrane and this may have been the cause of my nausea and vomiting, but who knows. It has not returned. It is frustrating to me that I cannot find a local doc who will monitor for me, however to stop, in my opinion, is like being in an airplane headed straight toward the ground with no pilot and failing to try to fly the airplane. Time waits for no man and at my age I do not intend to sit idly by and pontificate on why I should not experiment. I wish that I had unlimited funds to test my results but I will not let that stop me from searching for a solution to slowing aging. David Thank you. I found a local Dr. in Houston that will likely give script for sirolimus next monday. She was very intrigued by dr.Alan Greens website but wanted to read more before writing script. So I will likely add Rapamycin to my experimentation. First I want to do a new full lab panel and aecho cardio for cardiac ejection fraction for a baseline for later reference. I am 70 and agree with you David, that at our age , wise experimentation is better than waiting for finished studies. David, How did you find a physician in your area who would prescribe dasatinib? Brenda Van Dyke Hi Brenda, Further up this page you will see that I have replied to Brennan regarding a source of Rapamycin, Metformin and Dasatinib. No Dr prescription required and excellent prices. jpurc Thanks for the info! I didn't, my physician just put his head in the sand. I found a source in India who does not require script. This is one of my largest concerns, trying to find a Doctor who is leading edge and not afraid to prescribe off label. Thank you David, I will look for the section on Rapamycin, I get mine from IAS. You are right about the doctors, they are all afraid of the tyranical FDA, the enforcement arm of Big Pharma. Dasatinib 60x 20 mg tablets (Sprycell) available from www.antiaging.clinic (entry code 'Research') to be uploaded this week. They donate 15% to research. Here is the email address of the company in India where I buy my products. trademedimpex@gmail.com I suggest you email them for prices. I have bought Rapamycin, Metformin and Dasatinib from them at very reasonable prices. Their pills are well presented individually in bubble packs and very businesslike response to your order. I am very happy with this company. It will supply these products without a Doctor's prescription.This is fine for me as I live in the UK where it would be impossible to buy them here. Just to give you an example of the cost. I paid £128 for 2x2. doses of Dasatinib for my husband and myself. Quercetin you can buy without prescription from Amazon quite cheaply. Just make certain you follow the recommended chart to receive the right dosage. Thanks for the reply. Could you please also provide the website address for the company you mentioned. It looks like the name may be MD Supply located in India. Also, I'm not sure what is meant by "2X2. 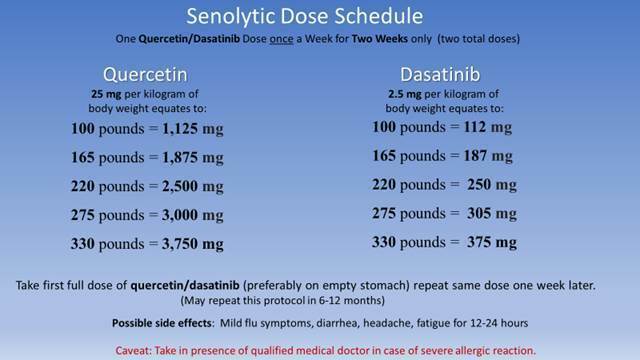 doses" of Dasatinib. Does that mean two doses for two people? How many capsules is that and how much Dasatinib in each capsule? Thank you. Ozone8 If they have a website I don't know of it. My impression is of a rather small company in India that somehow gets these drugs and resells them. My contact is through dropshipmd.com I have a bottle of 60-70mg Dasatinib capsules on the way (I hope). The cost was $330.00. At this point I'm forced to get political (my apologies): Its due to Democrats and Republicans that we can't go to a pharmacy and buy this stuff at free-market prices. Vote Libertarian! jerry searcy I have purchased through this company several times and they always deliver. Coming from India can take a little time but I have always received my order. I have ordered both rapamycin, and Dasatinib. The rapamycin was delivered in a one mg tab and the Dasatinib in 20mg tablets. 03/20/19, just received bottle of Dasatinib. They seem o.k to me. Yes Jerry I too have found this company very good, excellent prices, quick service and well produced product. Just hope the purity is good . My husband and I have been taking Rapamycin and Metformin also from this company since August 2018 with no ill affects. Just a report on the Dasatinib and Quercetin I have been taking. I have now taken the recommended dose with a weekly interval between them. The first dose was on Sunday March 10th and in the evening I had a headache which lasted into the night. I took an aspirin and the headache went away. I had no further side effects. The second dose was on Sunday March 17th and there were no side effects. I am 90 years old, so I was very pleased that the second dose didn't give me a headache, but just in case there was any blood thickening I took an aspirin. It is now a week since I took my second dose and I have noticed a small weight drop from 152 lbs to 149 lbs., but that is the only difference so far and no change in my eating pattern. I will keep you posted about this.